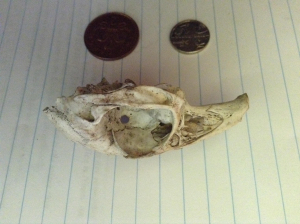 A rabbit's skull. The skull is 70mm long,25mm high and 35mm wide. There are 6 teeth sockets either side of the jaw, and a further two teeth at the front of the mouth for fourteen teeth in total. The skull was found in a wooded area surrounded by fields and there was no sign of the rest of the skeleton.